So I'm going to say something pretty controversial here, and I want you all to understand this is not coming from a place of disrespect. Long time fans know that while I've been critical of Lady Antebellum, it's more because I see tons of potential that just doesn't materialize as often as it should. And you should also all know that when Charles Kelley put out his solo record last year, two songs from that album made my year-end list of the best songs of 2016 - and one song, 'Leaving Nashville', topped that list, it was my favourite song of last year, across the board. 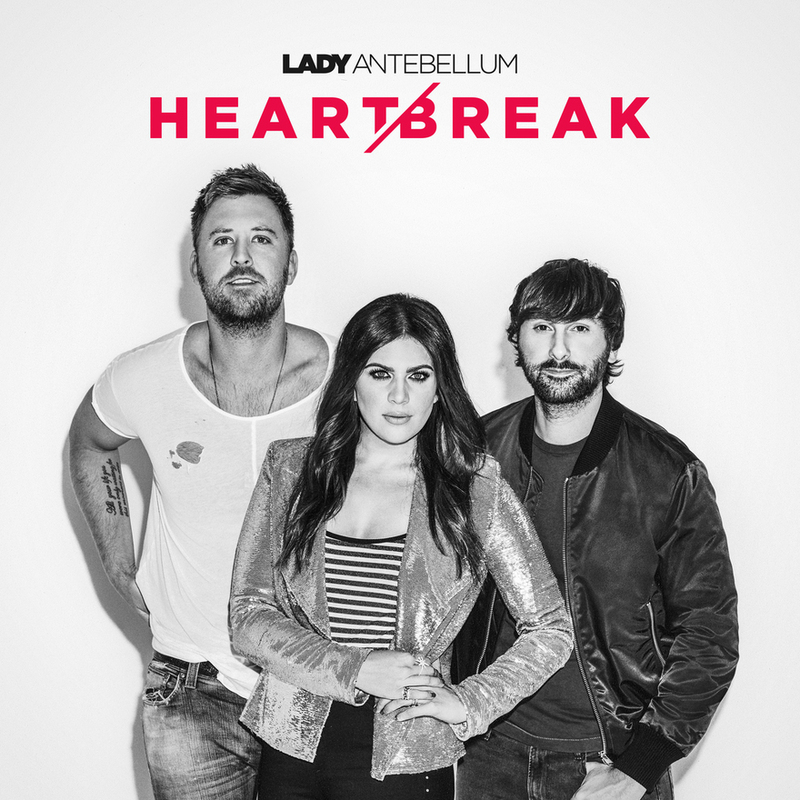 So now that you all have that context, let me say this: going into this record, I was convinced Lady Antebellum should have stayed on hiatus, or maybe just broken up entirely. As a group together, they always felt uneven to me, hitting some tremendous high points that balance emotional maturity and great harmonies, but it's always felt imbalanced to me, skewed towards Hillary Scott instead of an even balance between her and Kelley. And with that more middle-aged approach to country, catering a little more to the adult alternative crowd, I've expected the writing to build to a level of sophistication that just hasn't materialized in the same way. I know they're in their thirties and they're not Little Big Town - who are all in their forties and their music is starting to sound like it - but I started to get uneasy when I saw the main producer behind Heart Break is busbee. And don't get me wrong, he can be tolerable with the right people, but nearly always more on the younger, trendier pop country mold, which just struck me as the wrong fit for Lady Antebellum, and lead-off single 'You Look Good' didn't help my feelings. But hey, I was willing to give this something of a chance, so what did I find on Heart Break? Honestly, I got exactly what I expected: a decent enough project from Lady Antebellum, but nothing I'll really remember or care about in a week or so. And what frustrates me is that with every listen to this album I see a band that could be a lot more interesting or challenging, but instead coasts on songs that don't showcase all the potential they have. Very little of what this record delivers is unique or among Lady Antebellum's best, and while they've got no outright missteps that annoyed me about Golden or 7/47, it doesn't really make this all that interesting. But let me start off with the one thing they unquestionably did right here: vocal balance. No, I'm still not really crazy about Hillary Scott's delivery, and there are definitely a few points where they try to sneak in a few too many synthetic layers on the backing vocals - more on this in a bit - but for once it feels like Scott and Kelley are well-balanced across the track listing and they build in a little more interplay. Hell, one of the things I've always found missing from Lady Antebellum was songs that utilized the duo as creative counterparts in the narrative like they did on 'Need You Now', and to their credit, they actually step up to deliver here, with the absolute best case being 'Somebody Else's Heart', the sort of drunken hookup between friends who are on the cusp of being a little more that just nails the scene. And while I'd prefer more of those songs, they still find a way to subtly augment otherwise conventional duets well here, from the warning of possible heartbreak on 'Hurt' to the implied presence of how the ex still lingers in the background on 'Think About You' to the traded verses on 'Big Love In A Small Town' reflecting on a relationship forged of big dreams that didn't pay off. Hell, even despite the feeling they're coasting on a very middle-of-the-road two bottles of wine vibe on 'This City', 'Good Time To Be Alive', and especially the cockiness of 'You Look Good', I've always been a bit of a sucker for songs where couples party as a team. But here's the thing: it's these tracks, along the formless self-esteem anthem tripe of 'The Stars' or the 'there's no place like home' feel of, well, 'Home', that give me the impression Lady Antebellum is coasting and relying more on easy-going charisma than tighter or more ambitious writing, and to some extent I'm not sure it flatters either of our singers. It's more obvious with Charles Kelley - this guy has a hangdog brand of heartfelt power that I've always loved and yet doesn't play obviously to taking it easy - but Hillary Scott does showcase some intensity on songs like 'Somebody Else's Heart' that could really resonate if she had meatier material. Hell, the closing track 'Famous' almost serves as a slightly less interesting or defined version of 'Leaving Nashville' - more from the point of view of fame already achieved, which doesn't quite have the same desperation - but Scott does a really good job with it. And I'm not saying everything Lady Antebellum writes should be heavy or thought-provoking - after all, they wrote the majority of this record, this is what they want to make - but if you're going to stick with mellow vibes and writing that doesn't transcend that, it's not really going to hold my attention. And a big part of that problem... yeah, it's the production. And here's the thing: I have long accepted that Lady Antebellum is a pop country band, with the emphasis on pop appeal. They've always straddled that line in playing to a very slick, metropolitan sound, and while I'm not really crazy about it as a whole - especially with the more inorganic percussion - if it felt consistent I would probably tolerate it a lot more. Unfortunately, it's not, and it starts right from the fizzy beat behind the title track, not helped by the flimsy backing vocals around it, and when you follow it with the prominent thrumming bass and big horns around 'You Look Good', it becomes hard to spot the country side of this group! And yet when switch back to the atmospheric but recognizably pop country tones of one song later on 'Somebody Else's Heart, even if I'm not wild about how the kickdrum is micced, it can feel inconsistent. And from there the record breaks into two main pieces: the adult-contemporary leaning, slightly bass-heavy pop country that brings in strings and even pedal steel of songs like 'Hurt', 'Army', 'Big Love In A Small Town', or 'Famous' - which for the record tend to be better tracks - and the more conventional pop tunes that borrow from acoustic pop and even a little bit of modern folk, complete with millennial whoops and stiff backing beats. Hell, a song like 'Good Time To Be Alive' between the handclaps and larger choir or the choppy electric guitar line on 'Think About You' - even though I like the latter song - you could give those instrumentals to any number of more earnest pop-leaning acts and I wouldn't bat an eye! And I get it if Lady Antebellum found Nashville creatively stifling and they wanted to record elsewhere in California and Florida to pick up fresh sounds, but the sad fact is that they don't really feel all that fresh - just a bit tepid and rarely all that flattering or interesting for, again, a group that is capable of more. But as a whole... look, this fine, I'm sure Lady Antebellum fans will be plenty satisfied by this, but for a band who at its best can produce some tremendous songs I'm a little frustrated that album after album can't deliver more consistently beyond scattered pieces. And it's not like they're bowing to trends either in pop or country - compared to what Nashville is churning out, this is reasonably well-constructed and generally likable, it's a decent record. But I'm still convinced that Lady Antebellum can make a great record, which is why despite giving this a 6/10, I'm still recommending fans check this out - I'd love to see them get a little more traction or maybe a budget so they don't have to rely on busbee. Or hey, maybe they can all go their separate ways and I can get more Charles Kelley records - I wouldn't complain about that, just saying.